From time to time, I run into people who are interested in breaking into programming. Last night at the company holiday party a guy (we’ll call him Sam) walked up and introduced himself, asking for advice on how to move from his current role over to development. Sam’s attitude impressed me – those with a genuine desire to learn go places quickly. And on many occasions I’ve hired someone very green simply because I could sense a genuine interest in the craft and a hunger for knowledge. I’ll take attitude over aptitude. Presto. Next thing you know, you’re the senior developer telling other people how bad their code is! (Yes, everyone gets their turn). And remember, once you’ve built something, anything, you’re no longer merely “learning development” or wanting to “break into development”. You *are* a developer, so sell it. Don’t wait for someone to come pick you. Pick yourself. They can question your methods and your skill level, but no one can say you’re not a developer once you’ve crafted an application with your own hands. Hint: we’re all learning development together. Never apologize for that. Does this ring true for you? Join the conversations on Hacker News or Reddit. This entry was posted in Self Improvement and tagged Learning by Cory House. Bookmark the permalink. It’s common practice in the medical field to hear residents learn by 1) see one, 2) do one, 3) teach one. What you’re saying about action is completely true; whether it’s code or appendicitis , we have to get our hands dirty to make to make stuff stick. 1) When reading a programming book, I think it helps a lot to have the mind-set that you’ll write a review of it afterwards (on Amazon, or elsewhere). It forces you to put it in context, to think about what was good and bad, what you learnt, and what the key take-aways were. 2) Blogging is very good for clarifying your thinking on a subject. I like this quote by Joan Didion: “I don’t know what I think until I try to write it down”. What I would add, if you cannot arrange a teaching session for any reason, writing a tutorial is an alternative option – not just for programming, but also for grapsing the concepts of a new theory you are engaging in. I had to write a post about this topic after reading yours, though in no way is my post against your way of thought. Just so many people I know say these three steps and I kind of disagree. Nice article, thanks for some insight in the learning process. In the past year I have really enjoyed teaching others what I know and it’s such a great way to learn new things. 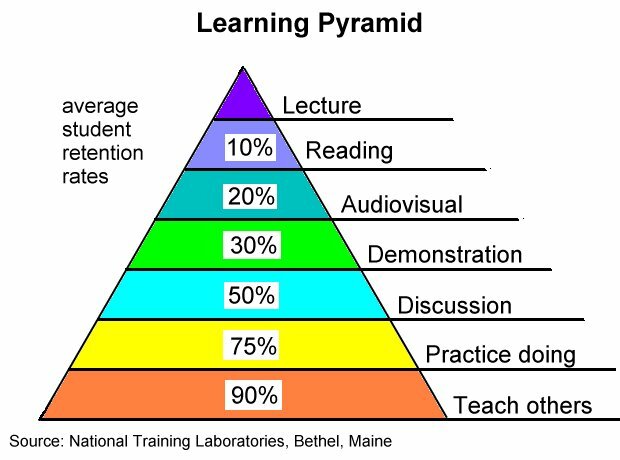 The retention rates from your pyramid appear to be from Eldon Ekwall and William Glasser. Despite some poking around on the internet and Google scholar, I could not find an original source. This document looks pretty interesting also. Watching Videos? Videos of what? How big guys doing programming? Please elaborate. Examples include Pluralsight, WatchMeCode, Uncle Bob’s Clean Code series, etc. Unfortunately the numbers are a myth. To suggest that someone who watches a movie remembers twice as much about the story than someone who reads the book is clearly not true. These numbers are based on Dale’s cone. See http://www.willatworklearning.com/2006/05/people_remember.html for a bit of interesting reading. Hello Corey House, nice share here, i really appreciate the time you used in sharing this tips, programming our brain to getting to learn more is hard, but your image said it all. Teaching others empower our brain to know and store more.! Teaching is Best. This increases the retention of the topic you learned or tried…. moreover motivates/forces you to do your best and become an expert. At least part of the retention information is from one of the first studies of learning conducted in the 1880’s or 90’s. It actually dealt with repetition and retention. The researcher’s name escapes me now. Obviously, audio visual and video were not part of that study but observing a lecture without any post-lecture thinking doesn’t lend to retention of information. Preparing to teach would obviously give one more internal representations and increase the retention. Or, at least that is how I read the numbers. One of the difficult part is to comprehend recursive algorithm, because they goes deep and deep. But following these steps certainly helps.